Researchers from the 'DROP' programme study the interactions between a large number of water droplets in a turbulent flow. PhD student Anastasia Bukhvostova, working under the supervision of professor Hans Kuerten and professor Bernard Geurts in the group 'Multiscale Modeling and Simulation' at the University of Twente, is developing a simulation method that can be used to investigate turbulent evaporation of water droplets in air down to the smallest detail. Physicists often compare turbulent flows in which evaporation plays a role with how sound propagates itself. The Mach number, the speed of sound compared to the flow rate of the medium, is very low in the case of the turbulent flows investigated here. Well-known effects such as shockwaves will therefore not occur. Nevertheless, compressibility may play a role as the local density of the air-water vapour mixture changes, for example because the water droplets in the flow rapidly evaporate. A turbulent flow of a mixture of air and water vapour droplets therefore has different transport characteristics than dry air. The interaction between the water droplets and the air-water vapour mixture will mainly be noticeable in the energy balance of the flow. Simulating these flows imposes special requirements on the numerical methods used. Differences between the speed at which the air mixture flows and the speed with which sound moves necessitate the use of extremely small time steps in the simulation. 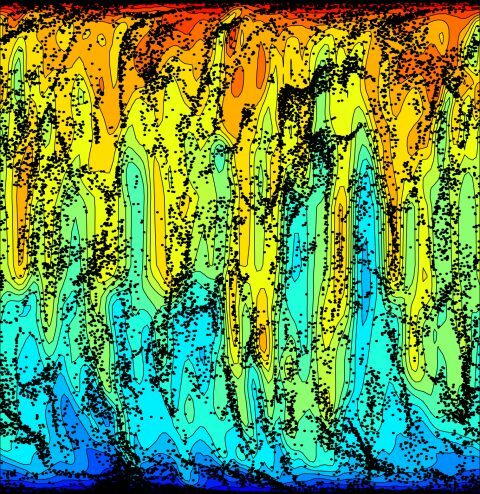 The researchers have developed a new calculation method with which they can calculate turbulent transport in combination with rapid evaporation. The research group has specifically applied this to the flow between two heated plates. This typical configuration is important in numerous applications. The simulation revealed that in the case of an air-water vapour mixture the efficiency of the heat transfer between the two plates is up to three times greater than is the case for dry air. That is because the mixture also ensures energy transfer via direct evaporation and condensation near the walls. This discovery is extremely important for a wide range of applications, such as the removal of water from biogas for use in the Dutch gas network. The simulation therefore provides both new fundamental and application-oriented knowledge. This underlines the importance of simulation in fundamental physics research. 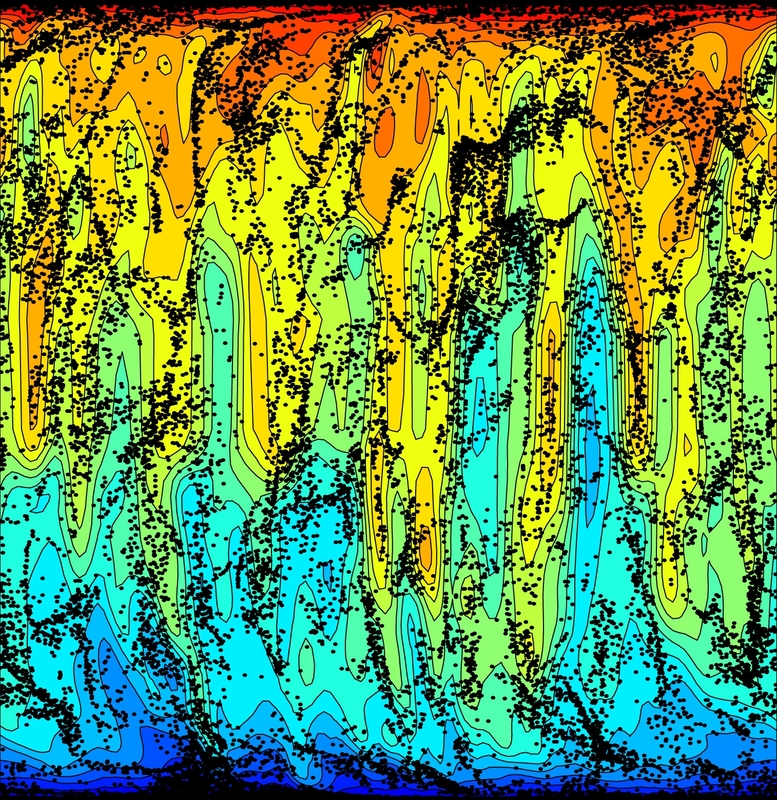 Representation of the temperature of the air-water mixture in the turbulent regime. Areas with a higher temperature are red, whereas colder areas have a blue colour. The positions of the water droplets are indicated by black dots. The droplets exhibit a preference to remain closer to the walls - an effect known as 'turbophoresis'. In the figure the flow moves from left to right.